Time for a make-at-home treat! 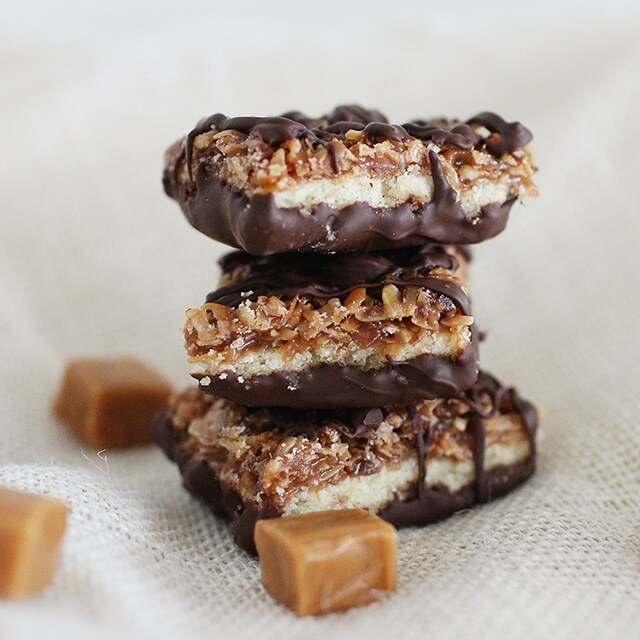 Kids will flip for these sweet, chewy Girl Scout Cookies Samoas Bars that taste like the boxed cookie classic. When we crave a sweet treat, we go homemade. Why? First of all, because freshly-made treats are the tastiest treats. Second of all, we love to use ingredients we know and trust! Especially when we’re cooking for, and with, our kids. 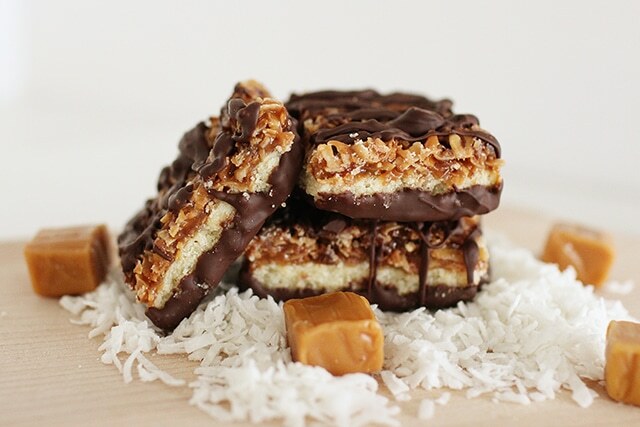 These Girl Scout Cookies Samoas Bars are absolutely indulgent, layered with a crunchy cookie base, chewy coconut caramel and bittersweet chocolate. Are these an everyday food around here? Nope, and nope. Try Healthy Carrot and Apple Breakfast Oat Cookies for that. But the next time you’re looking for a special treat and a fun baking activity to share with your kids, this one’s exactly right! 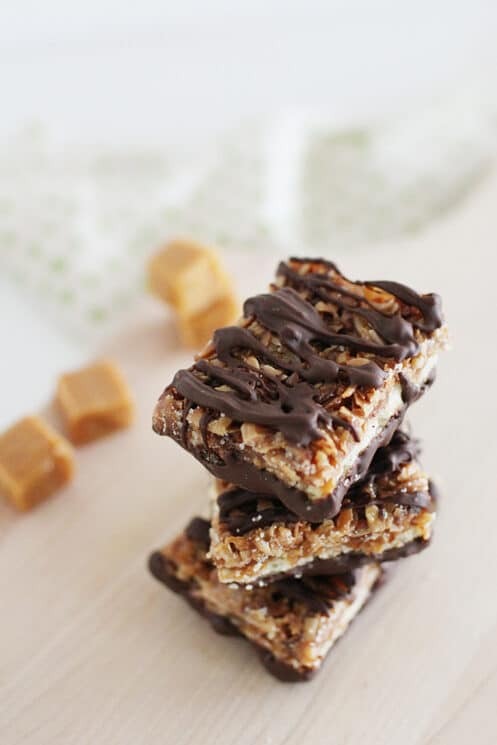 To make these bars, you’ll prepare each of the three layers separately, then assemble them all together into one sweet square of amazing-ness. Treat the first layer of these bars more or less like cookie dough: mix together the sugar, butter, flour, egg, vanilla, and salt in turn, then press this mixture into a baking dish and bake it. Easy! Melt chocolate chips in the microwave and dip each bar into the warm chocolate. Set the bars on parchment paper to cool. Then drizzle the last of the chocolate on top of the bars. All done! 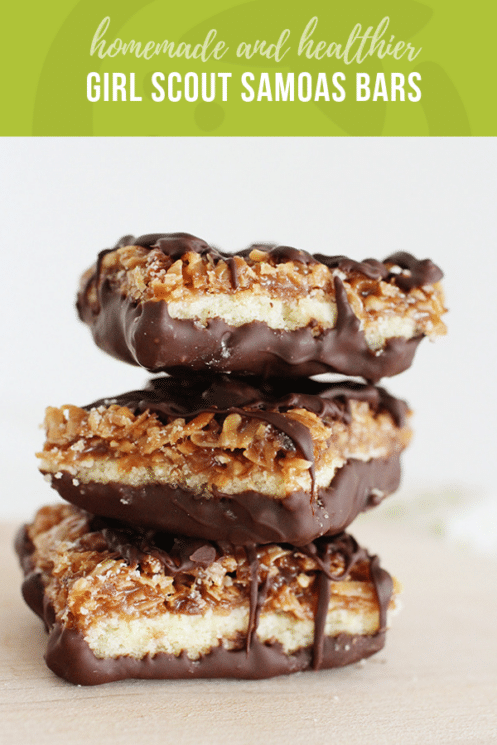 Just try your very very hardest not to devour these Girl Scout Cookies Samoas Bars before they cool all the way. They can be very messy when the chocolate isn’t fully cooled. Ask us how we know. Preheat oven to 350 degrees F. Lightly grease a 9X13 inch baking dish. Using a large mixing bowl, cream together the sugar and butter until light in color and fluffy. While continuing to beat at a low speed, add in the egg and vanilla until fully combined. Continuing to blend, add flour and salt gradually and mix until crumbly. Pour into prepared baking dish and press in. Bake for 30 minutes or until the edges have browned. Allow to cool completely. Reduce oven temperature to 300 degrees F. Line a baking sheet with parchment paper and then spread with the coconut. Place into oven and toast for 20 minutes. Stir every 5 minutes. Allow to completely cool. Place unwrapped caramels into a microwave safe dish. Add salt and milk. Cook for 3-4 minutes, stirring after each minute until fully melted. Mix in the toasted coconut. Spread onto the cooled cookie base and allow caramel topping to cool completely. Using a pizza cutter, cut into 15 bars. Place a clean piece of parchment or wax paper on the counter. Using a microwave safe dish, melt the chocolate chips. Dip the bottom of each bar into the chocolate and the place onto parchment paper. Drizzle the remaining melted chocolate over the bars. Allow to completely cool. Store in an airtight container. 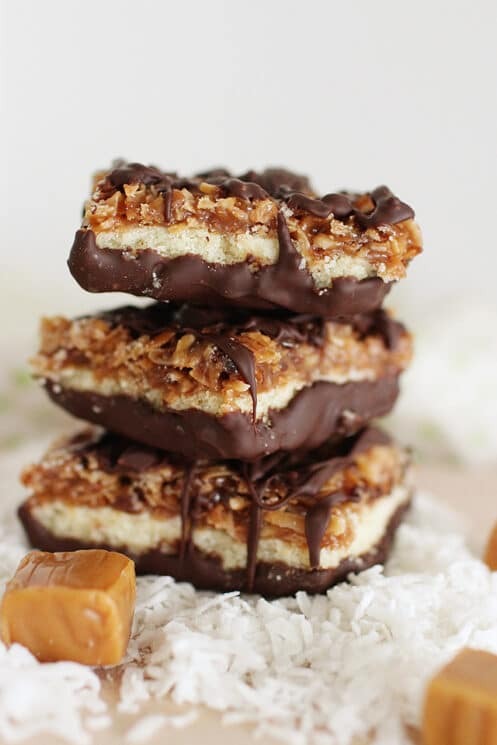 Do you recommend using sweetened or unsweetened coconut flakes? 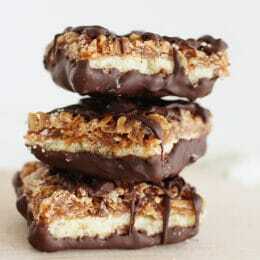 Hi Lauren, we recommend the unsweetened coconut flakes in this recipe.